Brandon Despain (middle, beard) following the Roasters Choice award announcement at the US Coffee Championships in Long Beach. Photo courtesy of the SCAA. The Roasters Choice competition takes place largely behind the metaphorical curtain, with coffees roasted in advance of the U.S. Coffee Championships weekend. 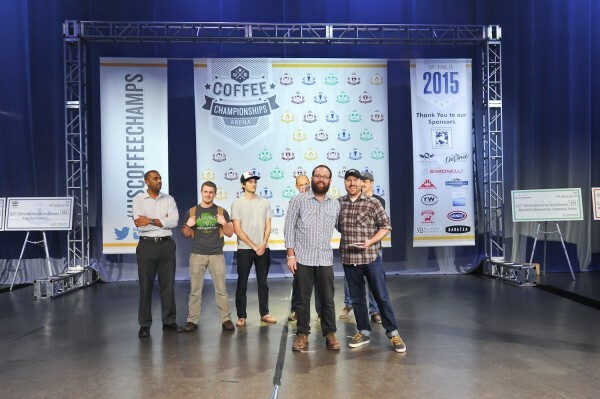 As Brandon Despain of Logan, Utah’s Caffe Ibis was roasting his competition coffees in the weeks leading up to February’s event, his aspirations of winning were moderated by his competition inexperience. When, how and why did you get into roasting? I’ve been in coffee on and off for 10 years. My first job in coffee was with Caffe Ibis at the cafe, initially just as a cashier and then barista. At the time I was doing a lot of seasonal work at green houses and doing plant surveys for the university. The cafe was a great place to work in the winter. 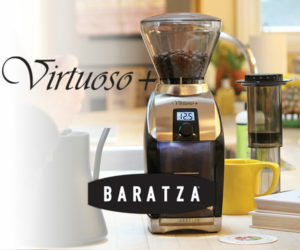 I became more and more interested in making coffee as I realized how challenging it was. Being a barista was an incredibly satisfying job for me, and it was a rare day when i didn’t feel challenged. After working at a few different cafes in Salt Lake, I felt like I had hit a wall in my quest for coffee knowledge. I thought I had learned everything I could about being a barista and decided to move home and try and get a job as a roaster with Caffe Ibis. They weren’t hiring for roasters, so I just kept working as a barista. Eventually, about 5 years ago, the opportunity presented itself and I jumped at the chance. It really opened up a whole new world for me. I realized that I knew nothing about coffee and that it was a much bigger world than I originally thought. There have been many paradigm shifts since then, both as a barista and a roaster. Can you share some thoughts on how Mr. Wirth helped influence you as a roaster? Randy was my roasting mentor. I feel incredibly lucky to have had the opportunity to work with him. His roasting style is still a huge influence on me. He really focused on the art side of roasting and always taught me to trust my nose above all else. The last year has been difficult without him, to say the least. Randy was the person I could geek out on coffee with as an equal. If it wasn’t for him, I don’t think I would have the dream job that I do. As a company, Caffe Ibis is older than many people working in the coffee industry. How would you characterize roasting for a company with such deep roots, and what might the future have in store? Caffe Ibis has been around a long time and our selection is diverse, to say the least, so a lot of my efforts go into maintaining existing profiles. 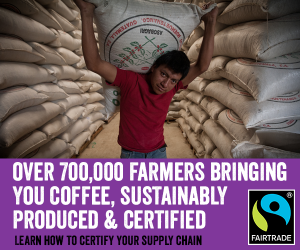 The other big thing happening with Caffe Ibis is our shift towards all organic coffee. I started this project with Randy a few years ago because we both felt very strongly about it. When Randy and Sally initially started, organic coffee wasn’t available from many origins, but that has changed quite a bit in the last five years. 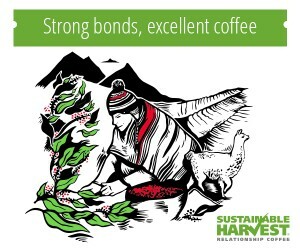 It still isn’t readily available from some origins and we have chosen to discontinue those coffees. For the competition, what was your approach to coffee selection? I didn’t spend a lot of time on coffee selection. I just picked my favorite coffee at the time, which was Ethiopian Gedeo Worka. The coffee came to us through Max at Royal. This is the third year we have had this coffee and every year it gets better. Initially, we picked it up because I was pushing Randy to bring in more micro-lots and coffees that did well as a light roast. It was, and continues to be, a fantastic coffee even when it starts to get a little old. You mentioned there are some elements of arts and olfactory awareness in your roasting style. How do you approach each roast? Caffe Ibis is what I would call an old-school coffee company. What that means for me is that I deal with many different roasting extremes and everything in between. We do incredibly dark roasts all the way to really light roasts. I am not personally a fan of the really dark or light stuff, not that there is anything wrong with either of those. My favorite coffees, and the way I always approach a new coffee, is to seek out the balancing point. As for my style, I’d say it is 50/50 art and science. Randy really helped me dial in the art part of it, but I have come to really value the science part of coffee. For me, it’s the only real way to have any consistency and understanding of the art and craft of coffee. 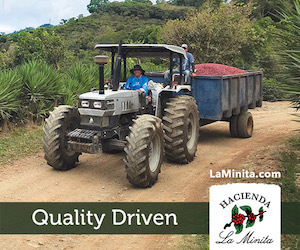 What does a Roasters Choice win mean to you? For me, it has been a vehicle to advance my craft and passion for coffee. I didn’t enter to win. I entered for the feedback so I can continually improve.